One of the most powerful features of displaying data is the use of subforms. A subform is a form with its own data source that is embedded in another "master" form. 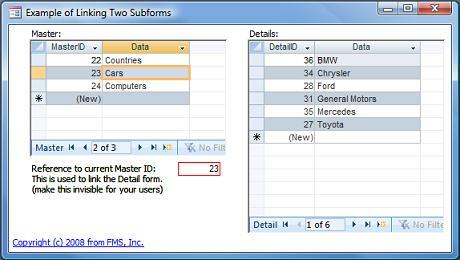 Subforms provide a powerful way to easily see related data, especially one-to-many relationships, without writing code. 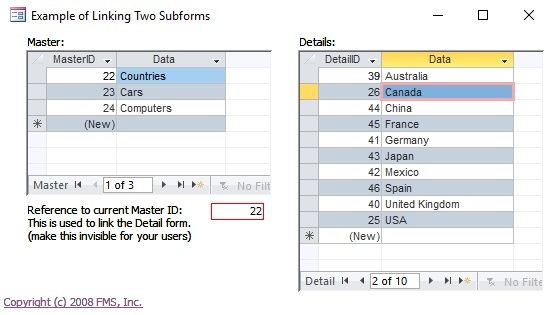 Access automatically filters the data in the subform based on data in the master form. This is accomplished by setting the Link Master Fields and Link Child Fields properties of a subform. Rename the control for the MasterID field to txtMasterID. This differentiates between referencing the control or the underlying field. We want to reference the control. For situations where you want to filter on more than one field, the Link Master Fields and Link Child Fields can contain values separated by semicolons. Just match them in the order desired. As a habit, one should always reference the control name rather than the field name for the Link Master Field. For more information, read Microsoft Access Subforms Master Link Fields. What if you want to show a list of the "master" records and the corresponding detail records of the current master record? Fortunately, you can easily do this by just setting some properties without writing any VBA code! To do this, we create an unbound (no recordsource) form and put two subforms in it (look at the frmParent form in the sample database). The first subform (frmMaster) is the list of master records, and the second (frmDetail) contains the details. We synchronize the subforms using the Link Child Fields and Link Master Fields properties of the detail subform. In a regular main to subform design, the Link Master Fields property would be based on a control on the main form. In the two subforms scenario, the second subform is filtered on a value in the first subform. 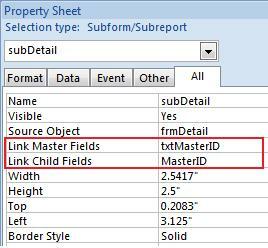 Unfortunately, the subform's Link Master Fields property cannot directly reference a field in the first subform. It can only reference a field in its parent form. Fortunately, there's a simple workaround. Create an intermediate text box on the main form for the LinkMaster value. This references the current record in the master subform, then the detail subform can link to that value. By making this control invisible, your users won't see this link. where subFormName is the name of your master subform control, and ControlName is the name of your control that the detail records are filtered. Now that the master value is exposed, we call this control 'txtMasterID' and use it as the Link Master Field for the second subform. It's good to keep this text box visible while you design and test the form. Once it's working, set its Visible property to No so your users don't see the magic you've created!